Charges: No daily charges. Membership fee of Diss & District AC for club sessions. 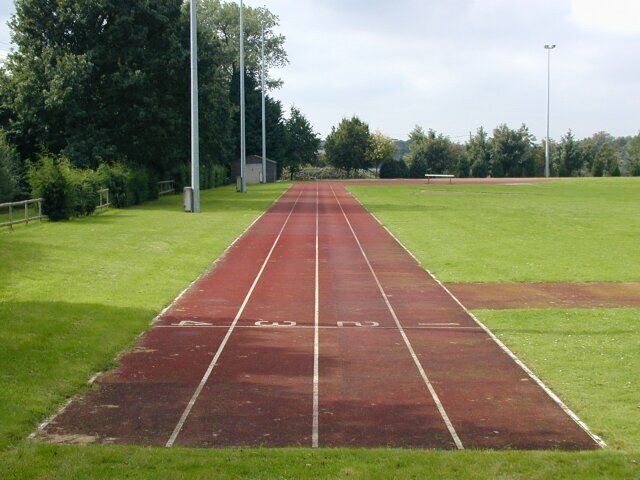 This "J" track opened in 1991 and consists of a 120m straight which allows for 110H races, one bend and a shorter straight about 57m in length with a LJ/TJ pit at one end and a PV bed at the other. The total track length in lane 1 is 160m which means that races or intervals up to 150m can be held. The track was planned to be in the centre of field but as this field slopes, the whole track would have needed elevating. It was thus positioned at the top end of the field with only the shorter straight being elevated. Unfortunately this has meant that there is no room to add to the track in the future. A 400m grass track with one lane is marked out in summer from May to September in the middle of the field around the cricket pitch. The home straight of this is uphill and consequently the back straight is downhill. The DT/HT cage is at the other end of the field to the J track and is odd in that the larger DT circle is in front of the HT one although neither are in good condition and the landing area is downhill. The pavilion at the ground opened in March 1989 and was a gift to the people of Diss from G.N. Rackham & Sons Ltd.